Adopts the appearance and abilities of any mob. 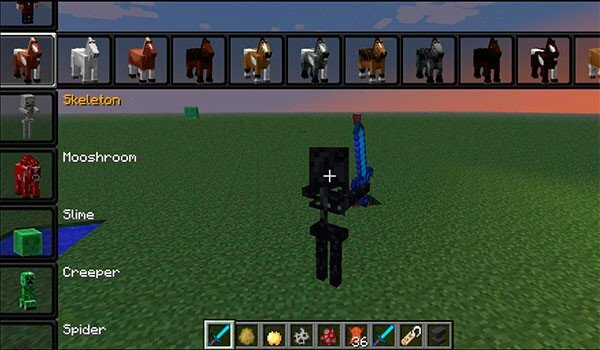 Morph Mod 1.7.2 and 1.7.10 is a mod that allows us to change the appearance of your character Minecraft pudiéndonos convert any being, that is, any animal, any NPC, any mob, or even any being that is added by any mod. To transform into any character, before we finish them, that is, if we want to be a bird, before we kill a bird. To transform into another being, our character will take both positive skills, how negative that being. For example, if we become a bat or a bird we will have little life, but we can fly. To access the menu where we can change our appearance by any other mob, we must press the “?” or, “¿”. How to install Morph Mod for Minecraft 1.7.10 and 1.7.2? Double-click the downloaded file to run the installer Forge. Paste the “iChunUtil” downloaded file into .minecraft/mods folder. Change your character for any mob, and acquires its strengths and weaknesses!